Experience the flavor of this authentic third generation recipe that dates back to the 1920’s. Influenced by the traditional simplicity of the Longobardi region and the rich, spicy flavors of Sicily, together Grandma and Grandpa Stancato created this distinctive sauce. Turn a simple meal into an enjoyable Italian feast with our gourmet sauces! Buon Appetito! Stancato’s uses the finest and freshest ingredients to insure these authentic third generation recipes passed down from Grandpa and Grandma Stancato. These pasta sauces will bring a taste of Italy and Stancato’s to your next meal. Stancato’s original and most exceptional! This smooth house-made Roma tomato sauce was made famous by Grandma and Grandpa Stancato. Premier Sauce is the most desired at our restaurant and will turn any meal into a true Italian feast. INGREDIENTS: California Vine Ripened Tomatoes, Water, Tomato Puree (water, tomato paste), Imported Pecorino Romano Cheese (made from sheep’s milk, salt, cultures, rennet), Sugar, Olive Oil, Salt, Dehydrated Garlic and Onion, Natural Pork Flavor, Spices, Natural Flavor. 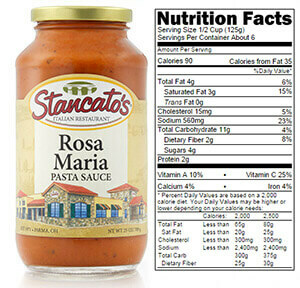 Stancato’s Rosa Maria Sauce is our most exotic! Aromatic Rosemary, chunky tomatoes and Romano cream blend fresh excitement with tradition to create this absolutely marvelous sauce. Try it on your favorite Italian dish and you will be captivated by its’ unique flavor. INGREDIENTS: California Diced Tomato, Tomato Puree (water, tomato paste), Heavy Cream (pasteurized cream, lactic acid), Onions, Aged Imported Romano Cheese (made from sheep’s milk, cultures, rennet, salt), Salt, Garlic, Canola Oil, Spices, Natural Flavors, Sugar, Extra Virgin Olive Oil. 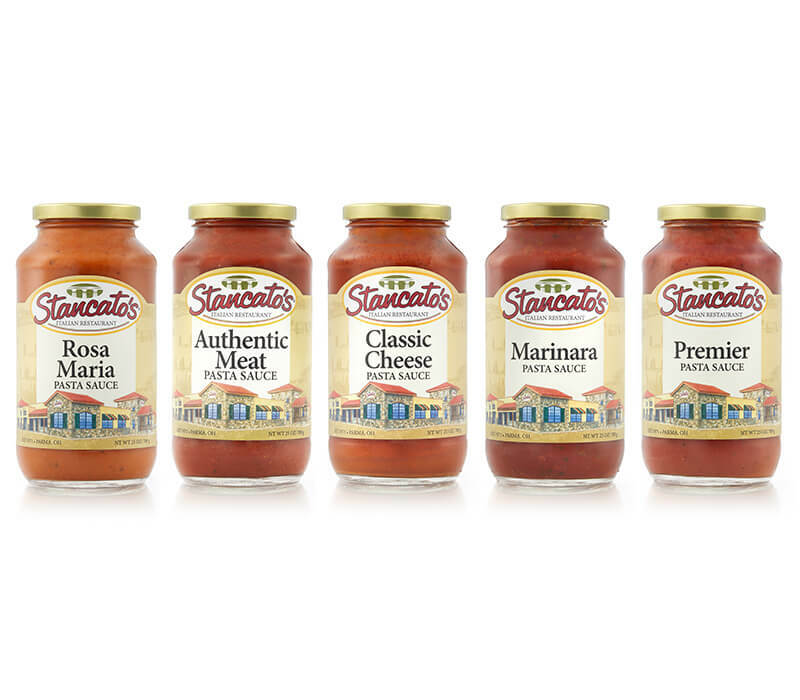 Stancato’s original Italian recipe was handed down through three generations and is the same award winning sauce served at Stancato’s Italian Restaurant today. The essence of Stancato’s Marinara Sauce can be found in the robust chunks of vine-ripened tomatoes laced with fresh garlic and basil. Not only delicious over pasta, it is also a great starting point for many other Italian specialties. INGREDIENTS: California Diced Tomatoes (vine ripened tomatoes, calcium chloride, citric acid), Tomato Puree (water, tomato paste) Water, Onions, Extra Virgin Olive Oil, Salt, Garlic, Sugar, Fresh Basil, Dehydrated Garlic, Spices. Stancato’s Premier Sauce blended with freshly grated imported Italian cheeses, enhanced with a rich butter flavor, are the reasons this sauce is superb for any Italian creation. The Stancato’s brought this secret family recipe from the Lombardy region of Italy, where the people relied on butter rather than olive oil to make rich sauces. Their love for cheese was so strong, that at one time they had a “cheese bank” where one could deposit cheese and have it stored for a small price. INGREDIENTS: California Vine Ripened Tomatoes, Tomato puree (water, tomato paste), Olive Oil, Imported Pecorino Romano Cheese (made from sheep’s milk, salt, cultures, rennet), Tomato Paste, Sugar, Salt, Natural Pork Flavor, Dehydrated Garlic and Onion, Spices, Natural Flavor, Natural Butter Flavor. 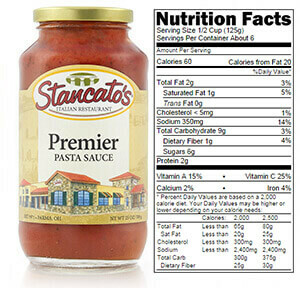 Stancato’s all natural Authentic Meat Sauce is loaded with the highest quality USDA certified meat, plump ripe tomatoes and just the right blend of Italian spices to give it an invigorating kick. 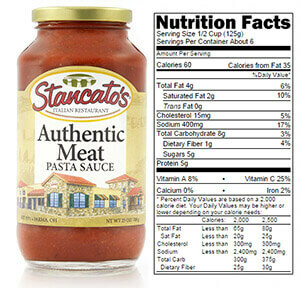 Stancato’s Authentic Meat Sauce is guaranteed to please any palate and is perfect for an easy family meal. This is not your ordinary meat sauce! INGREDIENTS: California Vine Ripened Tomatoes, Water, Tomato Puree (water, tomato paste), Ground Beef, Imported Pecorino Romano Cheese (made from sheep’s milk, salt, cultures, rennet), Sugar, Olive Oil, Salt, Spices, Natural Pork Flavor, Natural Flavor, Citric Acid.